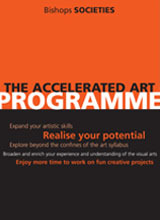 The Accelerated Art Programme (AAP) runs as a series of Friday afternoon workshops that are designed to develop the technical skills and knowledge of those showing exceptional talent and/or commitment to the visual arts. The workshops are open to students across the grades in the college, whether or not they take art as a subject. We have planned an exciting pinhole photography workshop with Dominique Edwards and Katherine Spindler at the Cape Town School of Photography this term. Boys will learn how to construct pinhole cameras as well as how to shoot and process their own negatives and positives. Boys will finish a bit later on these days as we will be travelling back to Bishops from Roeland Street in Town. The purpose of this conference was to provide our pupils with the opportunity to be addressed by a group of professionals working in various fields within the broad umbrella term of “the visual arts”. We invited presenters to speak about an aspect (or aspects) of their actual practice, and share some of the ideas that underpin that practice. Invited speakers included; Tom Eaton (author), Virginia MacKenny (painter & university lecturer), Luke Scott (architect), Marco Cianfanelli (professional artist, Luke Pedersen (industrial designer), Piet Viljoen (investor), Elaine Rumboll (poet, business strategist and accredited LEGO® SERIOUS PLAY® Practitioner). Term 1, 2014: Oil painting with a focus on working with limited palettes and diverse technical skills and strategies. Term 4: AAP boys created work in response to the theme "Time". The project was composed of several parts: conceptualising through making small sculptures within boxes, documenting the work, using this process of documentation to create/arrive at interesting images that informed a series of Drypoints. Term 2: Boys were introduced to various approaches, strategies and processes associated with painting. They completed numerous short tasks that were designed to strengthen their skills as many of them anticipated their particiaption in a wonderful workshop with visiting painter Andrew James (UK) (organised by Ashley Bestbier) from 11-13 July. Term 1: Boys helped to set up a temporary dark room & studio in the lower part of the Simpson Centre where they would be introduced to a short history of photography and photographic techniques (in particular, cyanotype) by visiting artist Dominique Edwards. Together with Dominique Edwards and Katherine Spindler the boys produced a series of cyanotypes relating to the theme: Self Portrait. Dominique Edwards was born in Kimberley, South Africa, 1980 and raised in Barkly West. She holds a MFA from the Michaelis School of Fine Art (2012), a post graduate certificate in education from the University of Cape Town (2003) and a bachelor in Fine Art from the University of Stellenbosch (2002). Formerly the Head of Cape Town School of Photography, Edwards has taught and continues to work with a broad spectrum of students at various FET and tertiary institutions in Cape Town. As an artist she is interested in the repetitive activity of human labour and notions of time and place which she explores by means of drawing, installation, video and photography. The art department was given an enormous roll of linoleum and it was this roll that served to inspire a large-scale relief printing project. Boys collaborated with their classmates to plan, cut and print their work. Because the prints exceeded that of our etching press, boys made use of a cricket pitch flattener to print their work. Several artists visited these printing sessions including printmaker Natasha Norman, and Grace Cross and Io Makandal of Open Drawer Projects (ODP). A group of boys, accompanied Ashley Bestbier and Katherine Spindler, went on a oil painting expedition in which they painted landscapes in different parts of the peninsula. On site they battled the elements as they learned appropriate oil painting techniques from Ashley Bestbier, an experienced landscape painter. AAP boys collaborated with street artist Andrew Brietenberg (Selah) on a piece of work on the subway wall directly opposite Bishops. The project afforded boys the opportunity to work with a practicing international street artist and in a public space. In addition to being given a lecture on contemporary street art, cutting stencils and developing an understanding of what is involved when spraying, boys were introduced to the challenges of working in a public space and on public property. Artists from The Open Drawer Projects (ODP) ran an in-depth workshop on contemporary mark-making with several of the Accelerated Art boys. Boys were introduced to a wide range of artists and artworks and created drawing mechanisms that produced drawings. Joshua Hewitson created a drawing mechanism that was powered both mechanically (with a small handle) and also by the wind. In addition to the aforementioned projects, Ashley Bestbier offered several workshops for Matrics who were working hard to complete and compile their portfolios for university submissions. AAP usually meets on Friday afternoons in the Simpson Centre from 14:45 -17:00. This term our meeting time is slightly different as we are travelling to CTSP in Roeland Street. We will meet at 14:20 and be back around 17:45.